DEPOSIT MATCH AVAILABLE ON SELECTED PLOTS! WE'LL MATCH YOUR DEPOSIT UP TO 5% TO HELP MAKE YOUR MOVE HAPPEN! Mandeville Place is part of the wider redevelopment of RAF Brampton and as the area evolves, residents will have access to a range of facilities including allotments, play areas and sports pitches. Transport links are fantastic, with the A14 & A1 nearby and the M11 within easy reach plus Huntingdon train station is just a 5 minute drive with regular services to London King’s Cross. With plenty of open green space, amenities nearby and a great selection of schools within easy reach, families of all ages will be well catered for at this elegant new development. 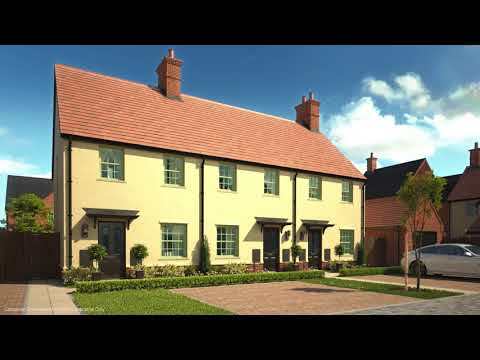 These stunning homes are surrounded by mature grassland, Georgian landscaped gardens and picturesque walking and cycling routes, so you can explore the wider area and appreciate the wonderful village setting. Whatever your interests, you’ll love exploring this historic market town. Travel back in time and visit the Cromwell Museum, don your best outfit for a day at the races, enjoy a picnic in the riverside park, or go on an adventure and follow the Historic Town Trail. For fitness and outdoor enthusiasts, there is a perfect blend of sports facilities and wild countryside to discover. Enjoy a relaxing day on the green and admire waterside views at Brampton Park Golf Club or stretch your legs on the village green and outdoor playing fields. Mandeville Place is ideally located for a multitude of lifestyles. Road and rail links are excellent, with the A14 and A1 nearby connecting you to local towns and villages. The M11 is also easily accessible, which links to Cambridge, Bishop’s Stortford and London. To commute by train, Huntingdon station is just a five-minute drive away and has regular services to London King’s Cross, with an average journey time of under one hour. For those that crave something more exotic, London Stansted Airport is one hour away and offers routes to a variety of international destinations. On Saturday 2nd March Crest Nicholson will be offering a unique opportunity to ‘Ask the Experts’ at an exclusive home buyer event, hosted at Mandeville Place in Brampton. From first-time buyers to second-steppers or those looking to downsize, a range of independent property experts will be on hand to offer tailored advice and support on property ownership in the local area. The final apartment is available to move in to now at Crest Nicholson’s highly sought-after Mandeville Place development in Brampton, Cambridgeshire. Our last remaining two-bedroom apartment is ideally suited to modern lifestyles and is available for just £237,950. We’re proud to be supporting this year’s Christmas lights switch on at the village green in Brampton, just a five-minute drive from our Mandeville Place development. The event will take place on Sunday 25th November, where everyone is welcome to join in the fun with an afternoon of festive cheer and carols. On Saturday 13th October, we will be hosting an Open House Event at Mandeville Place in Brampton. Join us from 11am – 4pm for the first opportunity to explore ‘The Stirling’, our brand new four-bedroom house type. Michaela Perkins, Sales Advisor at both Fairfield Gardens and Mandeville Place, has been awarded Bronze in the ‘Sales Advisor of The Year’ category at the Customer Experience Awards 2018.